Are you prepared for Christmas? Enjoy another great offer from Banana Republic Factory. Print the coupon and take an extra 20% off your entire purchase. 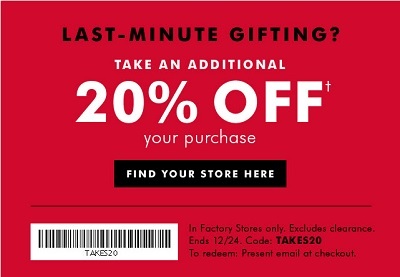 The offer is valid at Banana Republic Factory Stores in the U.S. and expires 12/24/2015. The coupon must be printed to receive the offer. Source of the information is Banana Republic. More details available at factory stores.